There are people,who leave a special trace, the invisible charm, elegance, refinement and luxury in history. She was such Lady the Lace. Jacqueline ,whom the American journalists nicknamed «our queen», occurred from old American aristocracy that made color of a society of new light. 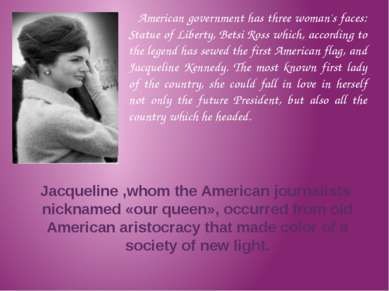 American government has three woman's faces: Statue of Liberty, Betsi Ross which, according to the legend has sewed the first American flag, and Jacqueline Kennedy. 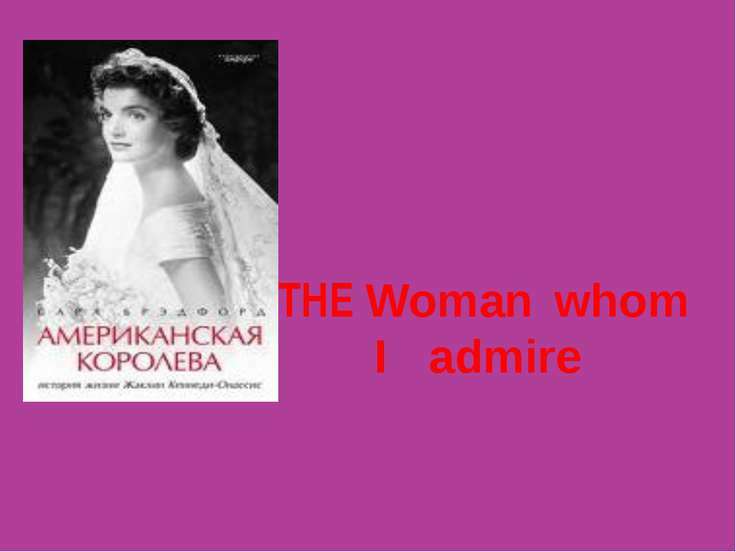 The most known first lady of the country, she could fall in love in herself not only the future President, but also all the country which he headed. Jacqueline Lee Bouvier was born on July 28, 1929, in Southampton. Her father, John, was a wealthy stockbroker on Wall Street whose family had come from France. Her mother, Janet, had ancestors from Ireland and England. 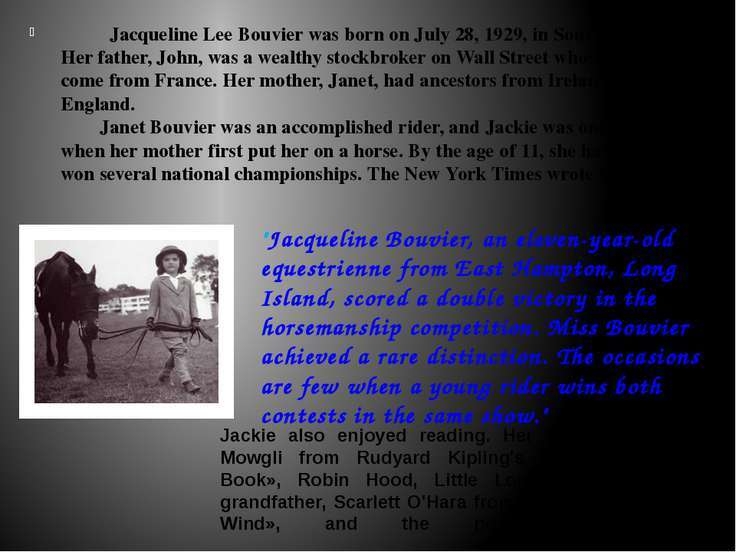 Janet Bouvier was an accomplished rider, and Jackie was only a year old when her mother first put her on a horse. By the age of 11, she had already won several national championships. The New York Times wrote in 1940: "Jacqueline Bouvier, an eleven-year-old equestrienne from East Hampton, Long Island, scored a double victory in the horsemanship competition. Miss Bouvier achieved a rare distinction. The occasions are few when a young rider wins both contests in the same show." Jackie also enjoyed reading. Her heroes were Mowgli from Rudyard Kipling's «The Jungle Book», Robin Hood, Little Lord Fauntleroy’s grandfather, Scarlett O'Hara from «Gone With the Wind», and the poet Byron. 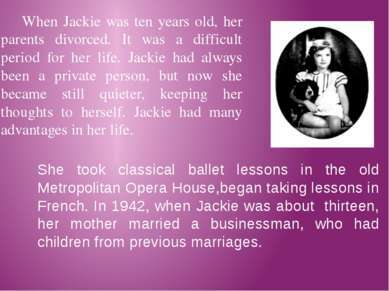 When Jackie was ten years old, her parents divorced. It was a difficult period for her life. Jackie had always been a private person, but now she became still quieter, keeping her thoughts to herself. Jackie had many advantages in her life. She took classical ballet lessons in the old Metropolitan Opera House,began taking lessons in French. 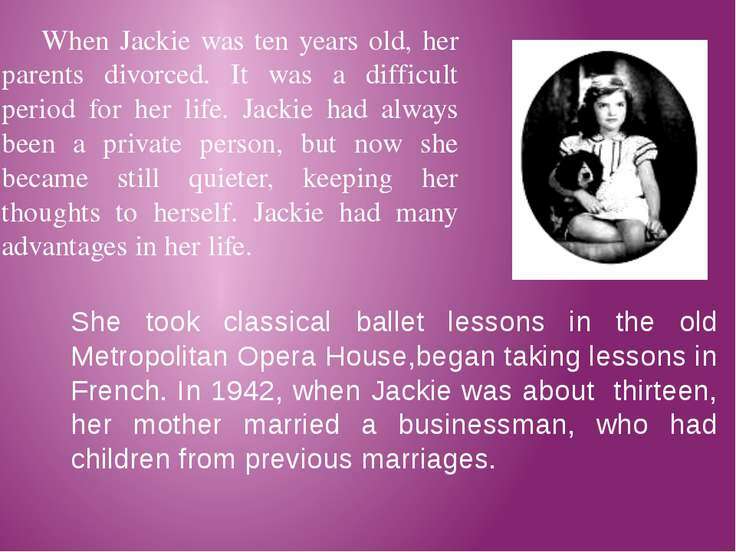 In 1942, when Jackie was about thirteen, her mother married a businessman, who had children from previous marriages. 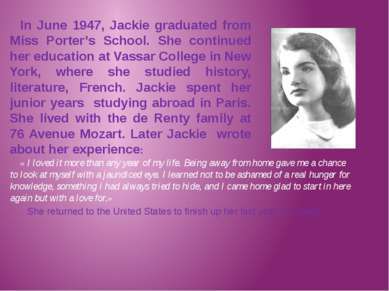 In June 1947, Jackie graduated from Miss Porter’s School. She continued her education at Vassar College in New York, where she studied history, literature, French. Jackie spent her junior years studying abroad in Paris. She lived with the de Renty family at 76 Avenue Mozart. Later Jackie wrote about her experience: « I loved it more than any year of my life. Being away from home gave me a chance to look at myself with a jaundiced eye. I learned not to be ashamed of a real hunger for knowledge, something I had always tried to hide, and I came home glad to start in here again but with a love for.» She returned to the United States to finish up her last year of college. 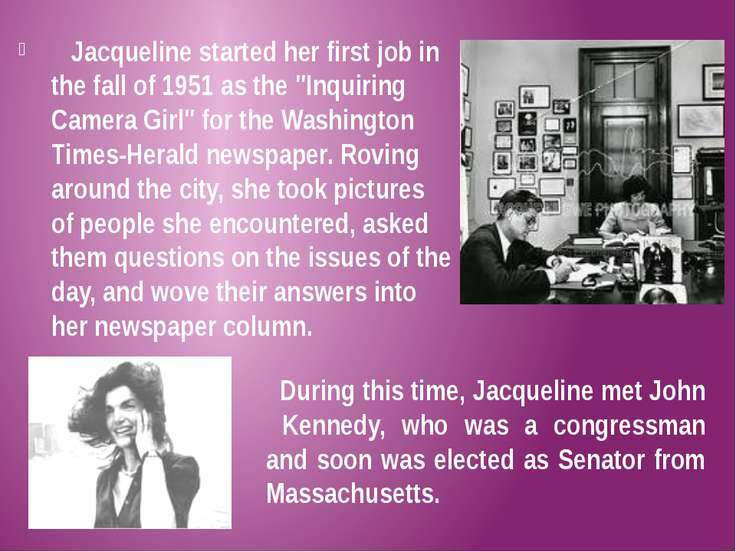 Jacqueline started her first job in the fall of 1951 as the "Inquiring Camera Girl" for the Washington Times-Herald newspaper. Roving around the city, she took pictures of people she encountered, asked them questions on the issues of the day, and wove their answers into her newspaper column. 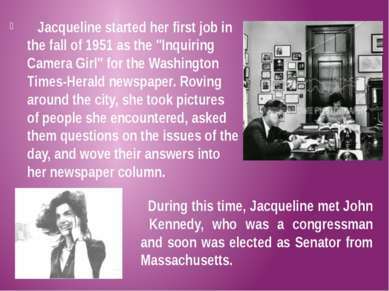 During this time, Jacqueline met John Kennedy, who was a congressman and soon was elected as Senator from Massachusetts. 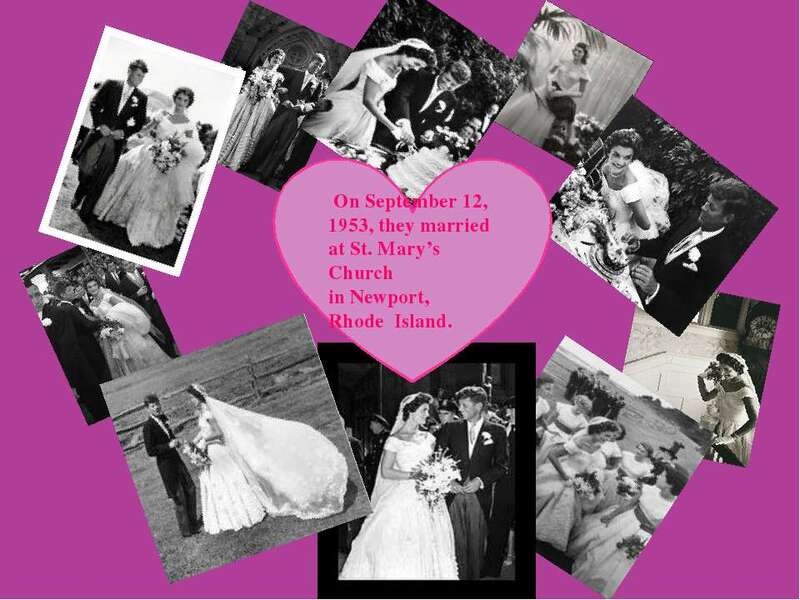 On September 12, 1953, they married at St. Mary’s Church in Newport, Rhode Island. On January 20, 1961, John Fitzgerald Kennedy took the oath of office to become the nation's 35th president. At THE age OF 31, Jacqueline Kennedy became the first lady. With her gracious personal style and her passion for history and the arts, she worked hard to be worthy of her new role. While she had a deep sense of obligation to her country, her first priorities were to be a good wife to her husband and mother to her children. She told a reporter that "if you bungle raising your children, I don't think whatever else you do well ." First Lady Jacqueline Kennedy, President John F. Kennedy, André Malraux, Marie-Madeleine Lioux Malraux, Lyndon B. Johnson and Lady Bird Johnson having just descended White House Grand Staircase on their way to a dinner with the French cultural minister, April 1962. The First Lady wears a gown designed by Oleg Cassini. Mrs. Kennedy soon set turned the White House into a real home for her family. Mrs. Kennedy also thought about what the White House represented to its many visitors and to citizens everywhere. She wanted people to have a greater appreciation of the history of America's most famous residence and its past inhabitants. 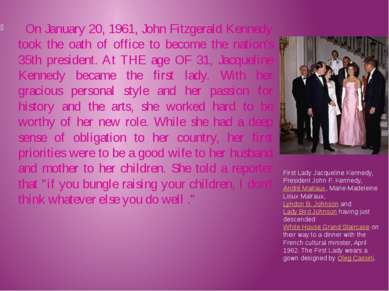 Her first major project as the first lady was to restore and preserve the White House. She enlisted the aid of many experts, established a White House Fine Arts Committee, and created the post of White House curator. Gathering outstanding examples of American art and furniture from around the United States (including many items that had belonged to former presidents and their families), she restored all the public rooms in the White House. 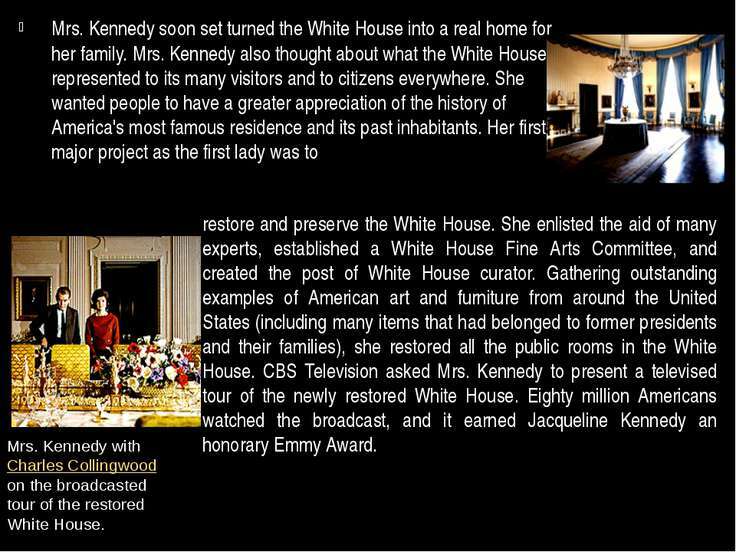 CBS Television asked Mrs. Kennedy to present a televised tour of the newly restored White House. 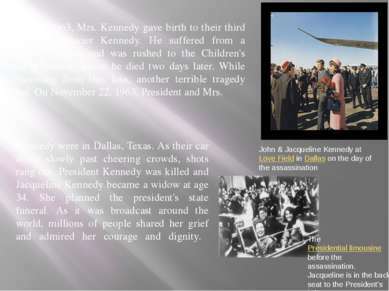 Eighty million Americans watched the broadcast, and it earned Jacqueline Kennedy an honorary Emmy Award. Mrs. Kennedy with Charles Collingwood on the broadcasted tour of the restored White House. 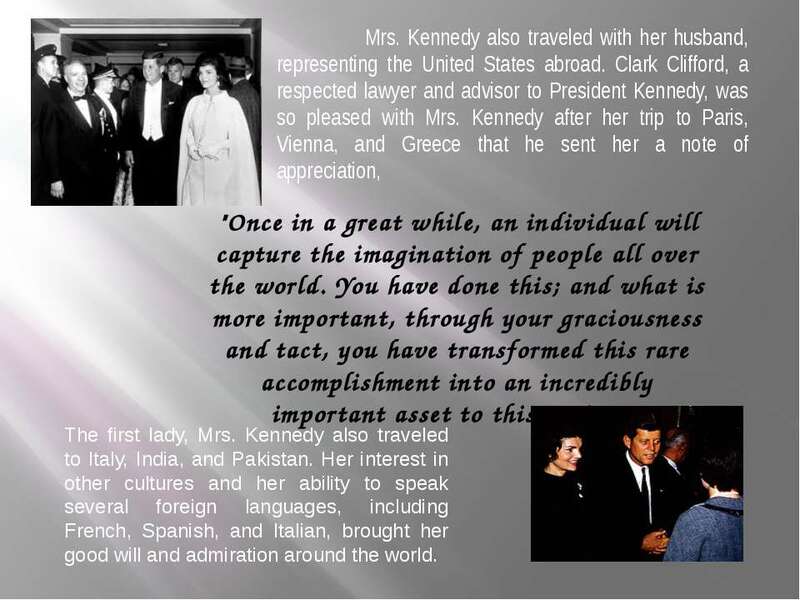 Mrs. Kennedy also traveled with her husband, representing the United States abroad. Clark Clifford, a respected lawyer and advisor to President Kennedy, was so pleased with Mrs. Kennedy after her trip to Paris, Vienna, and Greece that he sent her a note of appreciation, The first lady, Mrs. Kennedy also traveled to Italy, India, and Pakistan. Her interest in other cultures and her ability to speak several foreign languages, including French, Spanish, and Italian, brought her good will and admiration around the world. "Once in a great while, an individual will capture the imagination of people all over the world. You have done this; and what is more important, through your graciousness and tact, you have transformed this rare accomplishment into an incredibly important asset to this nation." 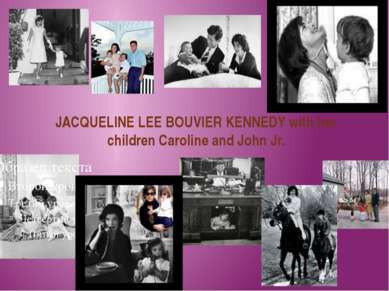 JACQUELINE LEE BOUVIER KENNEDY with her children Caroline and John Jr.
On August 7, 1963, Mrs. Kennedy gave birth to their third child, Patrick Bouvier Kennedy. He suffered from a serious lung ailment and was rushed to the Children's Hospital in Boston, where he died two days later. While still recovering from this loss, another terrible tragedy befell her. On November 22, 1963, President and Mrs. John & Jacqueline Kennedy at Love Field in Dallas on the day of the assassination Kennedy were in Dallas, Texas. As their car drove slowly past cheering crowds, shots rang out. 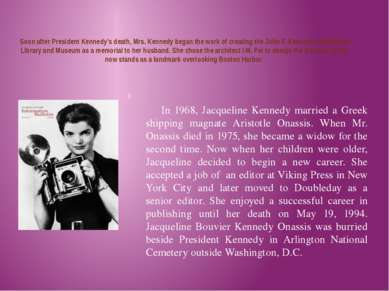 President Kennedy was killed and Jacqueline Kennedy became a widow at age 34. She planned the president's state funeral. As it was broadcast around the world, millions of people shared her grief and admired her courage and dignity. The Presidential limousine before the assassination. Jacqueline is in the back seat to the President's left. 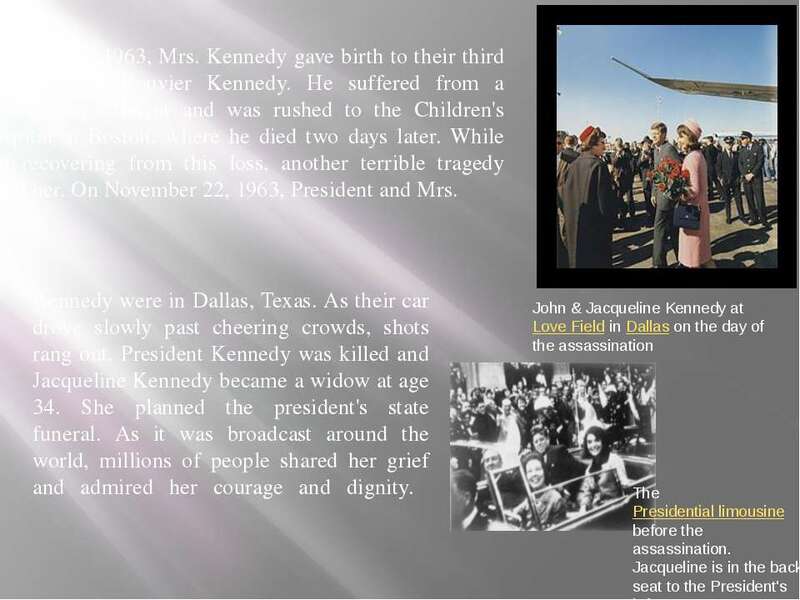 Soon after President Kennedy’s death, Mrs. Kennedy began the work of creating the John F. Kennedy Presidential Library and Museum as a memorial to her husband. She chose the architect I.M. Pei to design the building, which now stands as a landmark overlooking Boston Harbor. In 1968, Jacqueline Kennedy married a Greek shipping magnate Aristotle Onassis. When Mr. Onassis died in 1975, she became a widow for the second time. Now when her children were older, Jacqueline decided to begin a new career. She accepted a job of an editor at Viking Press in New York City and later moved to Doubleday as a senior editor. She enjoyed a successful career in publishing until her death on May 19, 1994. 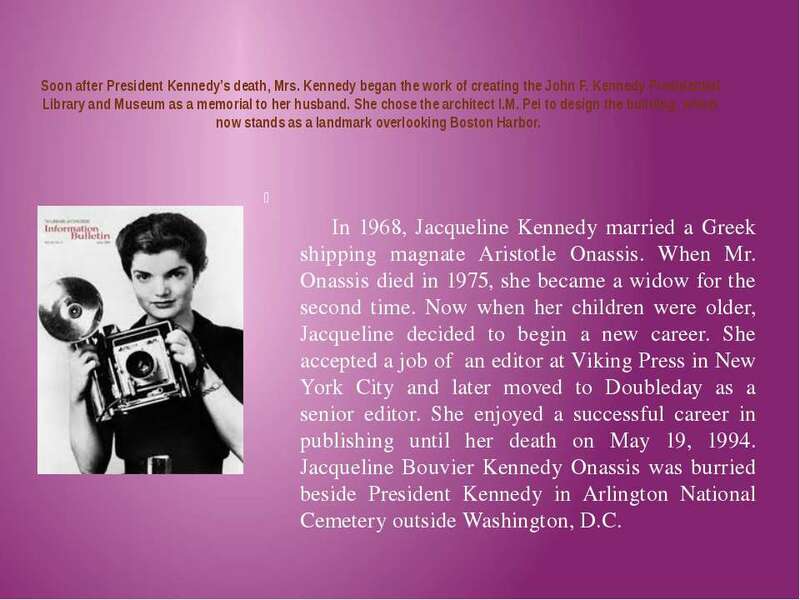 Jacqueline Bouvier Kennedy Onassis was burried beside President Kennedy in Arlington National Cemetery outside Washington, D.C. 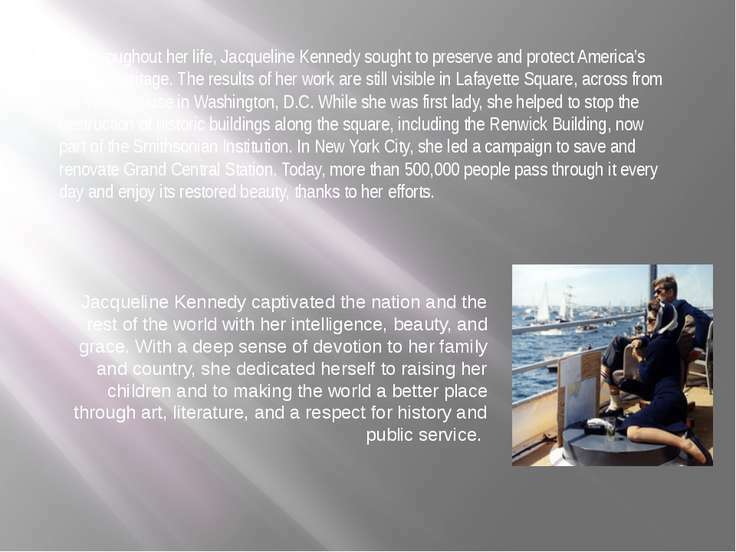 Throughout her life, Jacqueline Kennedy sought to preserve and protect America’s cultural heritage. The results of her work are still visible in Lafayette Square, across from the White House in Washington, D.C. While she was first lady, she helped to stop the destruction of historic buildings along the square, including the Renwick Building, now part of the Smithsonian Institution. In New York City, she led a campaign to save and renovate Grand Central Station. Today, more than 500,000 people pass through it every day and enjoy its restored beauty, thanks to her efforts. 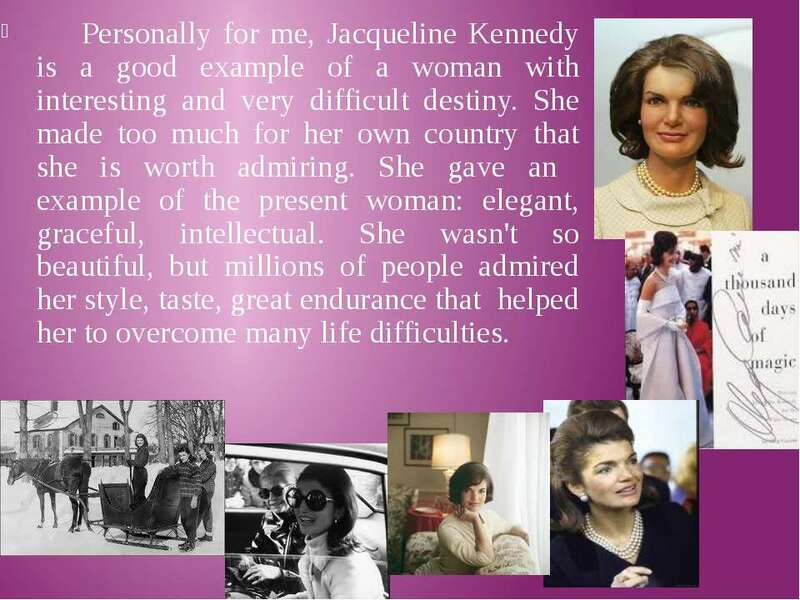 Jacqueline Kennedy captivated the nation and the rest of the world with her intelligence, beauty, and grace. With a deep sense of devotion to her family and country, she dedicated herself to raising her children and to making the world a better place through art, literature, and a respect for history and public service. The White House's East Garden was renamed the Jacqueline Kennedy Garden in her honor. In 2007, her name and her first husband's were included on the list of people aboard the Japanese Kaguya mission to the moon launched on September 14, as part of The Planetary Society's "Wish Upon The Moon" campaignю In addition, they are included on the list aboard NASA's Lunar Reconnaissance Orbiter mission. A school and an award at the American Ballet Theatre have been named after her in honor of her childhood study of ballet. The companion book for a series of interviews between mythologist Joseph Campbell and Bill Moyers, The Power of Myth, was created under the direction of Onassis, prior to her death. 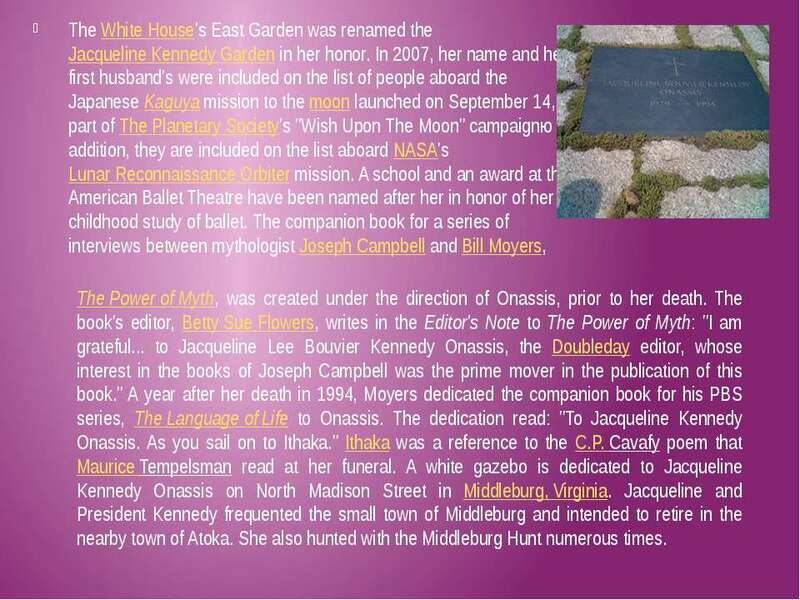 The book's editor, Betty Sue Flowers, writes in the Editor's Note to The Power of Myth: "I am grateful... to Jacqueline Lee Bouvier Kennedy Onassis, the Doubleday editor, whose interest in the books of Joseph Campbell was the prime mover in the publication of this book." A year after her death in 1994, Moyers dedicated the companion book for his PBS series, The Language of Life to Onassis. 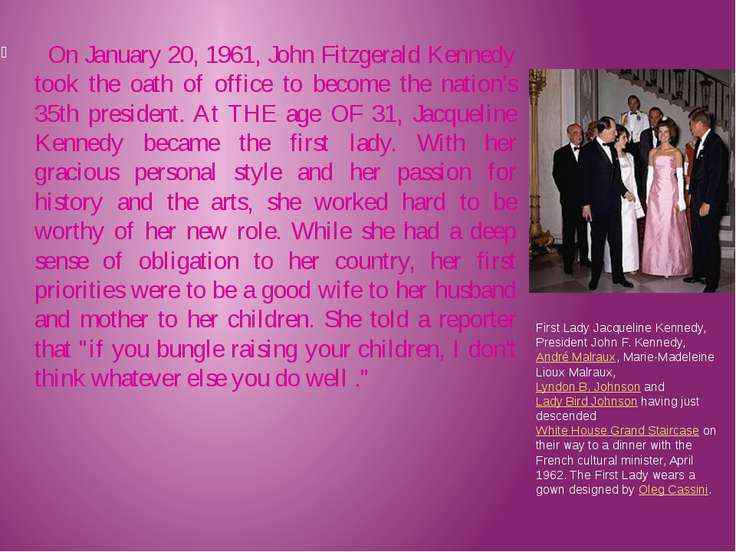 The dedication read: "To Jacqueline Kennedy Onassis. As you sail on to Ithaka." Ithaka was a reference to the C.P. Cavafy poem that Maurice Tempelsman read at her funeral. 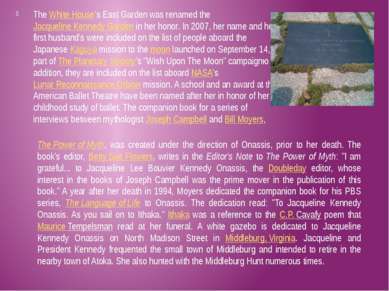 A white gazebo is dedicated to Jacqueline Kennedy Onassis on North Madison Street in Middleburg, Virginia. Jacqueline and President Kennedy frequented the small town of Middleburg and intended to retire in the nearby town of Atoka. She also hunted with the Middleburg Hunt numerous times. Personally for me, Jacqueline Kennedy is a good example of a woman with interesting and very difficult destiny. She made too much for her own country that she is worth admiring. 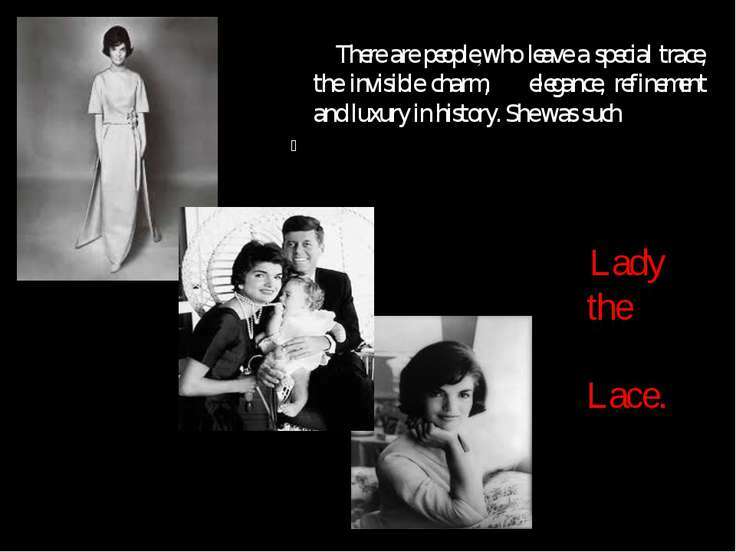 She gave an example of the present woman: elegant, graceful, intellectual. She wasn't so beautiful, but millions of people admired her style, taste, great endurance that helped her to overcome many life difficulties.